Learn how to draw a cute cartoon dolphin and then play with colors until you finally learn how to end up with a cool 3d dolphin! This amazing animal is quite interesting to illustrate. Made mostly from curved lines and circles, drawing all shapes accurately can be tricky sometimes. 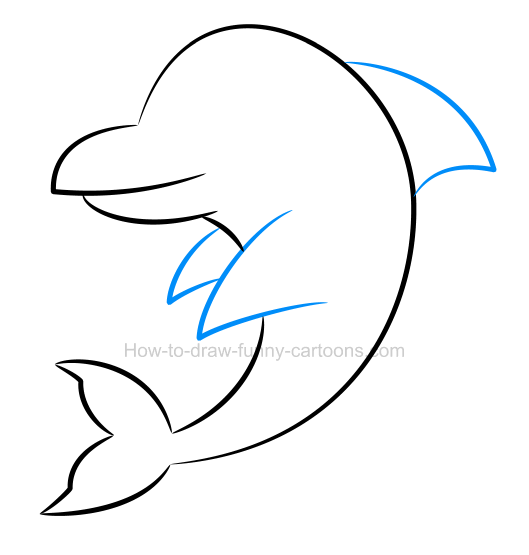 In this tutorial, I will show you how to sketch a beautiful dolphin filled with bright blue colors. Then, you will have the opportunity to see a few variations using different colors. Finally, I will convert this simple 2D image into a beautiful 3d dolphin using only simple effects. Before proceeding with this lesson, let's take a deeper look at this cool cartoon character using the image above. The tip of the nose is round and slightly flat. The eye is round, just like the pupil. 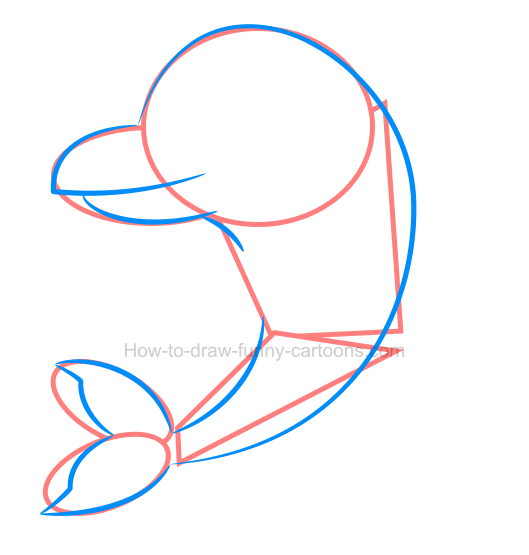 You can use a long curved line to form the head. The back fin is large and sharp. Don't forget to use a bright blue color! A lighter patch is visible on the chest of the animal. The tail is drawn using complex lines. Both front fins are smaller and pointed. step 1 - create a basic template! 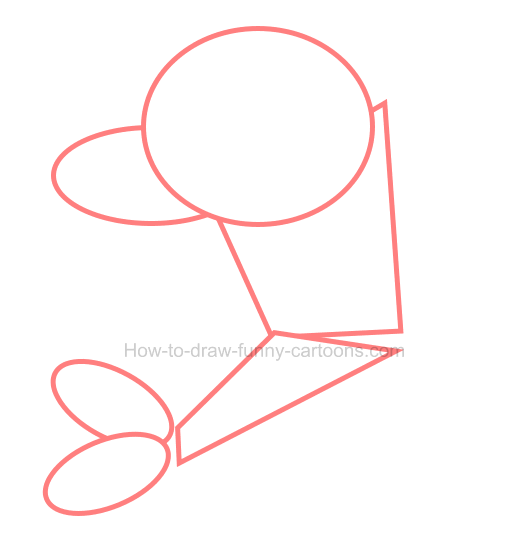 Let's draw a few basic shapes to start with. The head is made from a large circle while the mouth is done using an oval shape. The body is represented by two irregular rectangles while the tail is created using small oval shapes. step 5 - time for some colors! The whole illustration is filled with different tones of blue colors. Only plain colors are used for now. 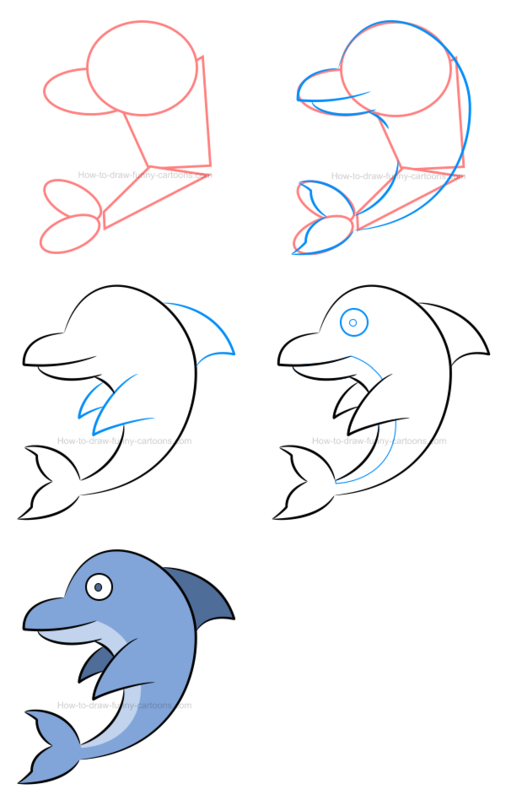 We will use gradient colors for the 3D dolphin only. Make sure that the patch is brighter, but the back fin and the one located behind the animal must be darker. Here you go! 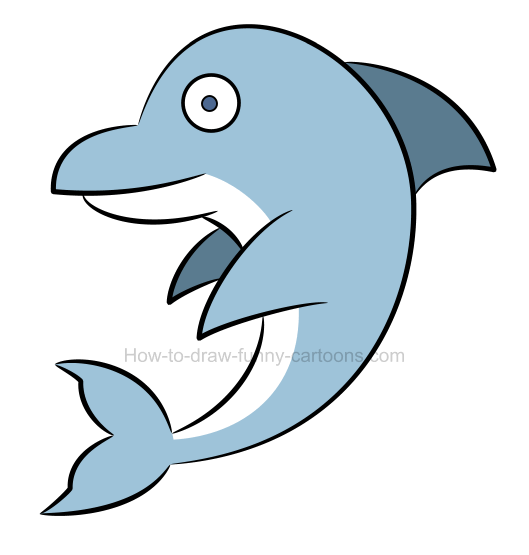 a cute cartoon dolphin! 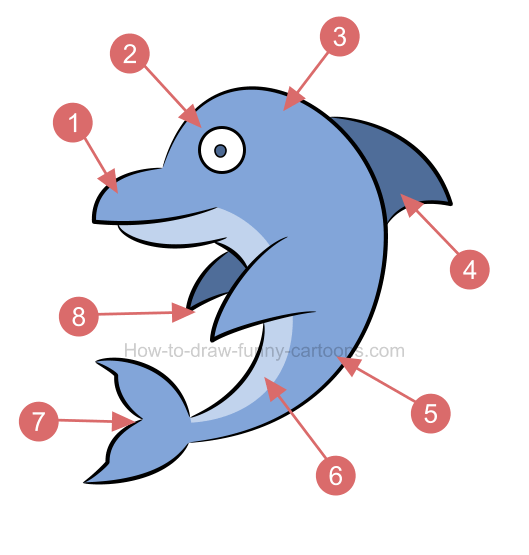 These are all five simple steps needed to create the dolphin. Simply pay attention to the mouth and the tail (which are the toughest elements to sketch) and you will be fine. 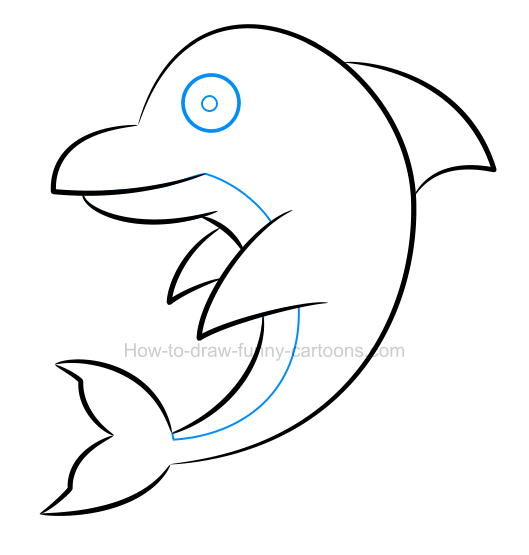 Ready to draw that 3D dolphin? Let's play with colors first! Dolphin are not really blue, but rather filled with a light grey color. The version below is closer to reality even if this is just a cartoon illustration. It's cool, but the blue version is definitely more enjoyable to look at! Cyan is ok, but not recommended! Another interesting version colored in cyan. This cartoon dolphin is also visually appealing, but somehow the illustration feels a little bit childish. A brighter version of the original color! This other alternative is also interesting. Colors are brighter and the patch is simply colored in white. The first version is still my favorite, but this other character is also worth trying. In this other example, colors are dark and saturated. Even the patch found on the chest is darker. It's definitely another appealing version if you like plain colors that are rich and hard to miss! This color is perfect! Not too dark, not too bright, not too grey and not too blue. It's not as close to reality as the grey version was, but it's close enough! 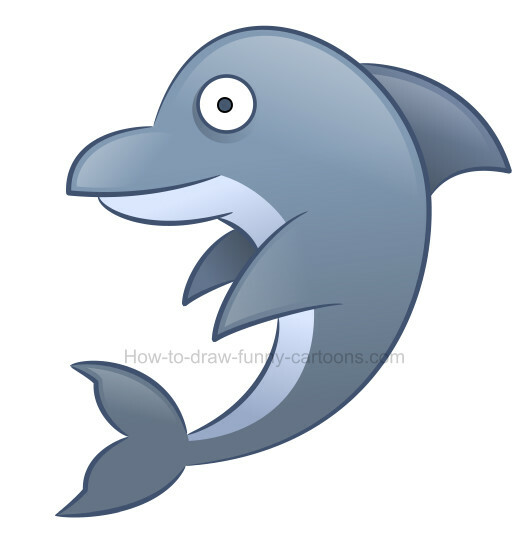 Let's take this illustration and turn our animal into a cool 3D dolphin using simple effects. How can you turn a simple 2D character into a nice 3D dolphin? Simply use gradient colors inside each part of the illustration. You can also add reflection (the brighter areas) on top of the head, on top of the tail and on top of all three fins. A small shadow was also added below the eye.